Apple just got 'cheaper.' Will you buy? 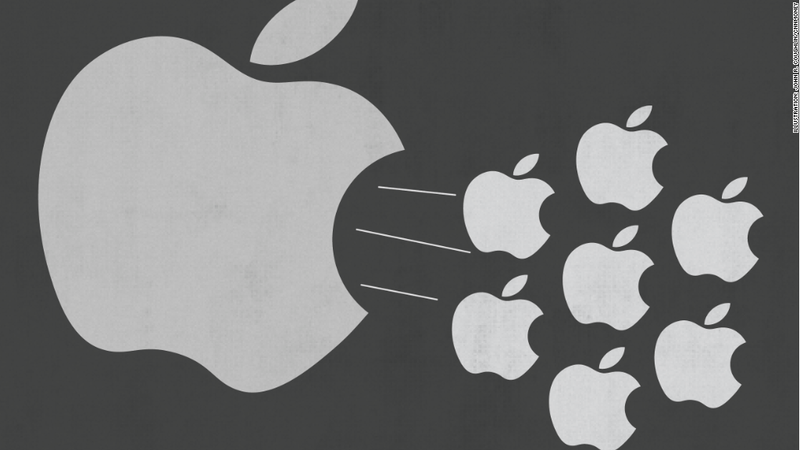 Apple is about to split its stock. 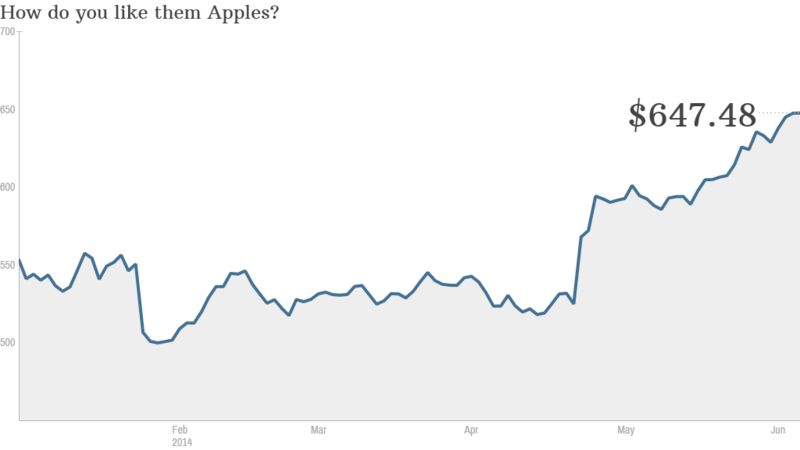 A share of Apple worth about $647.50 will become 7 shares at around $92.50. Apple is the most valuable company in the world. Many consumers use (and love) its products. Yet for average investors, the stock has often been too expensive to touch. You could buy a 16GB iPad Air with Wi-Fi and standard cellular connections for $629 --- and that costs less than one share of Apple. A share of Apple (AAPL) went from costing $645.57 (as of Friday's closing price) to about $92.44 -- give or take a few iCents. That's because the company did what's known as a stock split. It issued more shares to existing investors in order to bring down the price of the stock. Current shareholders received seven shares of Apple for each one they owned. As a result, the stock price is one-seventh of where it used to be. It's important to note that if you already owned Apple, nothing really changed. You just have more stock at a lower price. The value of your investment -- and the market value of Apple -- stays the same. So why is Apple doing this? Companies with stock prices above $100 often decide to split their stock to try and lure more individual investors. Depending on how shares of Apple perform following the split, other companies with stock prices in the stratosphere might also want to consider a split. Chipotle (CMG) shares trade for more than $560, for example. And Priceline's (PCLN) stock is trading for nearly $1,250. Even though the company's stock isn't really be any "cheaper" based on the way Wall Street experts value stocks, the stock will undoubtedly be more affordable. And the move comes at an interesting time for Apple. Shares have roared back to life this year and are now just 8% below the all-time high they set in September 2012. That peak price was just over $705. So the all-time high adjusted for the split will be closer to $100. Apple's stock has rallied for several reasons. The company is now using a big chunk of its nearly $160 billion in cash to pay dividends to shareholders and buy back stock. Stock buybacks are typically cheered by Wall Street because they are a sign a company believes its own stock is a good value. They also help to boost earnings per share by lowering the number of shares a bit. And Apple is a cheap stock by the measure that matters most to investing pros. The stock trades at just 13 times earnings estimates for Apple's next fiscal year. That makes it a better bargain than the broader stock market. There is also optimism about Apple's newly unveiled iOS 8 mobile operating system for iPhones and iPads. The company is likely to introduce its latest iPhone in August. And some think Apple has helped regain its coolness factor by purchasing Beats Electronics, the headphone maker and streaming music service that rap star Dr. Dre is a key investor in. So will you be more interested in buying Apple's shares once they begin trading for less than $100? Please tell us. And even if you wouldn't ever consider buying Apple, there's another reason why Apple's stock price may matter to you. The split may also help convince the people who run the Dow Jones Industrial Average, the most well-known barometer of the stock market in the world, to finally include the company among its exclusive group of 30 stocks. Apple is worth significantly more than the other tech companies in the Dow: Microsoft (MSFT), Cisco (CSCO), IBM (IBM) and Intel (INTC). Apple's annual sales are higher than all of them as well. But it's not currently in the Dow mainly because the Dow is weighted by stock price. And at $650 a share, Apple would have too much of an impact on the Dow's daily moves. That is no longer an issue now that the stock is trading under $100. There are already 11 companies in the Dow with triple-digit stock prices. But the highest is Visa (V) ... with a stock price of about $212. It's hard to imagine Apple being left out of the Dow for much longer. So that's why you need to pay extra attention to how its stock is doing -- even if you don't own it.